We won't hold it against you if the first thing you think of when you think of visiting the Bronx is going to Yankee Stadium, but if you're looking for a calm, beautiful spot to visit, you'll be much better served by visiting Wave Hill, a gorgeous 28-acre public garden and cultural space located along the Hudson River overlooking the Palisades. 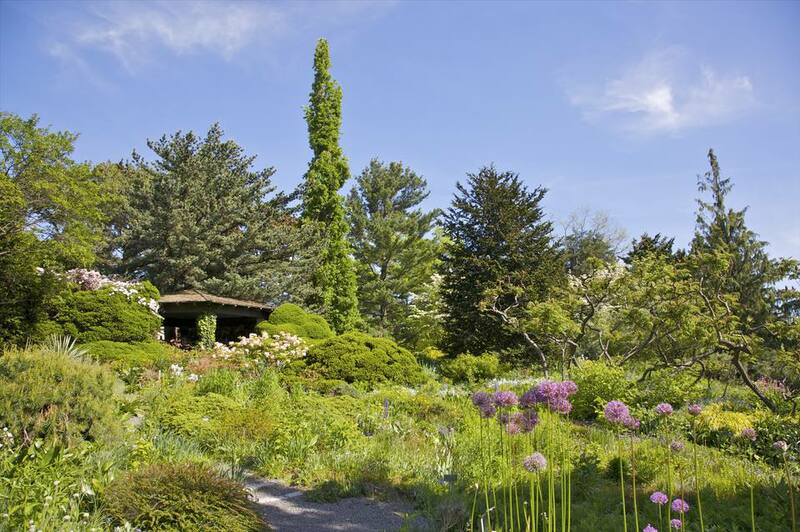 Here you can meander around gardens, see art, and take in some lesser known history. And not that many people know about it, so it's a rare spot in the city where you can be at peace. Here's everything you need to know before your visit. The Wave Hill House was first built as a country home in 1843 by William Lewis Morris. In 1960 Wave Hill was deeded to the City of New York by the Perkins-Freeman family and a non-profit was established in 1965 to manage it. You can read about the site's rich history (& many famous residents) on their website. Take a tour or guided walk through the gardens. Enjoy a nature hike along the Abrons Woodland Trail. Visit the current exhibits at the Glyndor Gallery. See the Elliptical Garden which was formerly the estate's swimming pool. See unusual potted plants in the Conservatory which has both a Tropical House and a Cactus and Succulent House. Visit any of the special gardens around the property. View the Hudson River and Palisades from the Pergola Overlook. If you want to be inside for a bit, visit the Wave Hill House which hosts a variety of public programs. Keep in mind that some places within the gardens close early. The Perkins Visitor Center, Wave Hill House, shop, and cafe all close at 4:30 p.m. The Marco Polo Stufano Conservatory closes between noon and 1 p.m. and at 4 p.m.
Every Wednesday in the summer Wave Hill has what it calls Sunset Wednesdays. There is live music set against the gorgeous backdrop. The Cafe at Wave Hill is located in the main Wave Hill House. It offers a seasonal menu that uses ingredients from Wave HIll's very own farm in Kinderhook, New York. There is something for everybody: warm entrees, sandwiches, salads, snacks, coffee, teas, beer, and wine. A fun activity is afternoon tea. With breathtaking views you can dine on scones, tea sandwiches, and of course tea. To turn it into a festive affair upgrade to the option with sparkling wine. Wave Hill takes seriously the fact that it's a garden and not a park. This helps create and sustain the peaceful nature of the space, but it means you need to leave your bike/scooter at the entrance. The Café in Wave Hill House offers light seasonal fare, coffee and afternoon tea.